Going on a mini break? YES! Got no space left in your bag thanks to All The Clothes? Yup. That capsule holiday wardrobe has always eluded me. Even when I'm packing for one night away my bag will be bursting at the seams as I convince myself that more than one breakfast outfit option is a must (it never is). To compensate, my cosmetics bag is lighter than a feather. So, swings and roundabouts! Here's how I pack light for a mini break. Hotel minis are the perfect size for a short break so next time you're away, make sure you suss out what's provided and snaffle any nice goodies. I 'liberated' these on another mini break. Packing heaven! 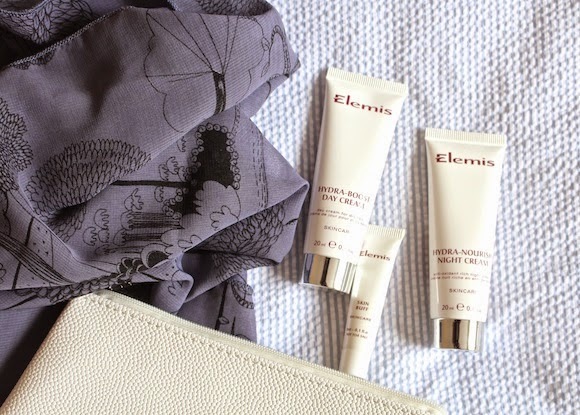 I use Elemis' full-size Hydra-Boost Day Cream and Hydra-Nourish Night Cream IRL so these 20ml pots are perfect for a short break. Next time you're on a beauty haul, ask the assistant to pop some samples into your bag. They'll make packing light a doddle! I've also chucked in this adorable Skin Buff. Not really an essential I'll admit, but ohmydays so cute. And buff skin on a mini break is pretty important, right? Samples are SO useful. Whenever I pick up a new mag I pull out any good brand's testers and squirrel them away for this very purpose. Here I've packed a Dr Organic mud mask, three sample perfumes (I like masculine smells btw) and a Crabtree & Evelyn nail polish remover wipe. Grab a teeny tiny toothpaste from the holiday section at Boots. Then try not to buy everything else in tiny too just because they're so adorable / make you look like a giant holding a normal size product. 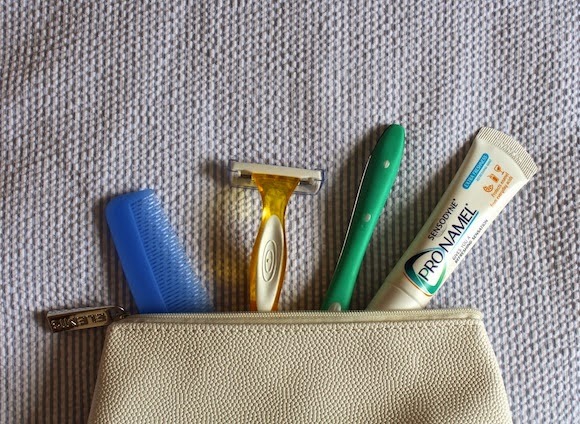 Pack a disposable razor... Use it, bin it, create space in your bag for a possible new buy on the way home. Add a comb and a toothbrush and you are good to go, my friend.